The shoot ‘em up you were looking for! New entry in the series will keep you entertained with all the things you’ve came to love in scrolling shooters. Meaty explosions, incinerating lasers, collosal bosses and diverse aircrafts to pilot. 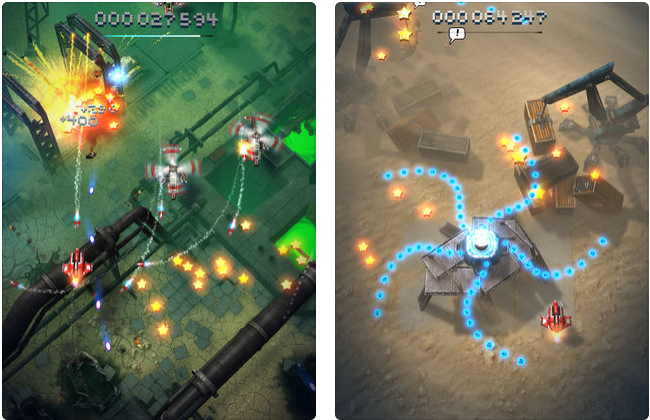 “Sky Force Reloaded” is not your average scrolling shooter. It will draw you in with its beautiful environments and intense effects. It will keep you with its superb gameplay mechanics, progression system and in-game collectibles. It will leave you wishing for more, once it’s over. Fortunately, there’s a lot to do before that happens. * Master 15 beautiful and immersive stages with challenging missions to complete. * Battle enormous and intimidating bosses, laugh when they explode and cry when you explode. * Unlock new difficulty modes, all the way from Normal to Nightmare. * Put yourself in danger to rescue missing operatives from the battlefield. * Assemble and test 9 different aircrafts. Pick your favorite, with its unique features and play style. * Hunt down 30 elusive bonus cards to add even more depth to the gameplay. Some of them will grant permanent benefits, while others will boost your abilities only temporarily. * Install hundreds of upgrades to your weapons, shields and other equipment. Turn your plane into a flying tank. * Complete in-game objectives to unlock 8 assisting technicians. Choose one of them to help you with their special skill. * Spot the wrecks of your fallen friends and get rewards for picking them up. * Appreciate highly polished gameplay and well balanced difficulty curve, whether you consider yourself a casual gamer or a die-hard shmup fanatic. * Enjoy professional voiceover and incredible electronic soundtrack. Welcome to your new favorite shoot ‘em up. Welcome to Sky Force Reloaded!